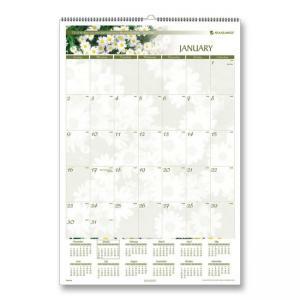 Media Size: 15.50" x 22.75"
Floral Wall Calendar features a different full-color floral image and quote each month. One-page-per-month format includes plenty of writing space for notes and appointments, full-year calendar reference on each page and Julian dates. Calendar is printed on high quality opaque paper. Design also offers a white wire binding with an eyelet for easy hanging and full chipboard back for sturdy support. $26House of Doolittle Landscapes Planner - 8.50" x 11"
$18House of Doolittle Earthscapes Monthly Planner - 8.50" x 11"
$18House of Doolittle Earthscapes Calendar - 22" x 17"
$14House of Doolittle 319 Calendar - 14.88" x 12"
$52Rediform Daily Untimed Planner - 7.87" x 10"
$77Day-Timer Sienna Simulated Leather Starter Set Organizer - 8.50" x 11"
$16Visual Organizer Executive Monthly Desk Pad - 22" x 17"